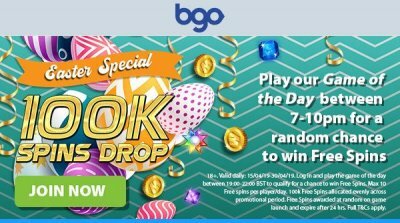 BGO players can win a share of 100,000 free spins this Easter. You can be one of the winners who will lay their hands on 10 free spins per day if you join the promotion and play the Game of the Day between 19:00 and 22:00 BST. The Easter edition of the 100k Spins Drop promotion runs between 15 and 30 April. Players who try their luck on the Game of the Day between 19:00 and 22:00 BST will qualify to take part in the promotion for a chance to win a set of free spins on the selected video slot. There is a total of 16 games of the day, starting with Temple of Treasure Megaways, which is the Game of the Day on 15 April and Finn and the Swirly Spin which is the selected slot for 16 April. Other titles include Slots O' Gold, Jumanji, Lightning Strike and Aloha: Cluster Pays, to name a few. On the BGO Casino website you can find the full list of the selected slots you have to play to qualify for the free spins prize. Each player can win a maximum of 10 free spins per day. Free spins can be used only on the game you have played to win them and they have to be used within 24 hours before they expire. They will be added to your account at random on the game’s launch and each free spin is worth 10p. All your winnings from free spins will be added to your cash balance with no wagering requirements you have to meet. You are allowed to clear your winnings any time you wan without restriction except for a minimum withdrawal amount. The standard BGO Terms & Conditions apply.